Photo courtesy of the Norris Church Mailer Estate. Norris Church Mailer (née Barbara Jean Davis, January 31, 1949, in Atkins, Arkansas) was an American artist, actress, model, and author of several books. Her publications include the memoir, A Ticket to the Circus, and the novels Cheap Diamonds and Windchill Summer. She is the mother of Matthew, her son with her first husband, and John Buffalo. After graduating from Arkansas Polytechnic College, Norris became an art teacher and, later, a successful model for Wilhelmina modeling agency. 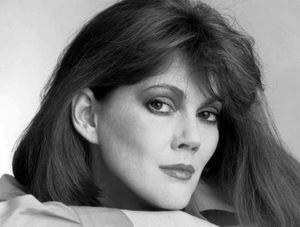 She held several successful one-woman art exhibits and appeared in Ragtime (1981), The Executioner's Song (1982), and the television drama, All My Children. Norris was a member of the Actors Studio. Norris's near 33-year marriage to her second husband, Norman Mailer, is frequently the focus of reviews about her life. Norris described Mailer as “the Henry Higgins to my Eliza Doolittle,” often seeking his advice on novel drafts and defending him against critics. A Ticket to the Circus chronicles her life. In 2004, Wilkes University established the Norris Mailer Church Fellowship in Creative Writing in her honor. Norris died in 2010 of complications from gastrointestinal cancer. ↑ 1.0 1.1 Moore 1989, p. 66. ↑ 2.0 2.1 Klemesrud 1979. ↑ Berger 2019, p. B11. Berger, Joseph (November 22, 2010). "Norris Church Mailer, Artist and Ally, Dies at 61". New York Times. New York. Bragg, M. A. (November 23, 2010). "Provincetown Arts 'hero' Mailer is missed". CapeCodOnline.com. Retrieved 2010-11-26. Harris, Ellen (December 2010). "The Norman Conquest, or The Last Wife of Norman Mailer Speaks". Belle Lettres. 11 (1): 22–23. Italie, Hillel (November 22, 2010). "Norris Mailer; her memoir tells of life as author's 6th wife". Boston Globe. New York. Klemesrud, Judy (April 22, 1979). "Life With Norman Mailer: So far it has been good to Norris Church". St. Louis Post-Dispatch. Klemesrud, Judy (April 22, 1979). "Mailer's Latest Love Story". St. Louis Post-Dispatch. New York. Moore, Frazier (April 1989). "The Very Versatile Mrs. Mailer". Interview. pp. 66–68. Mansfield, Stephanie (January 26, 1986). "Norris Mailer, Out of Arkansas The Author's Sixth Wife, Her Art and Her Roots". Washington Post. Wilkes University (2004). "The Norris Church Mailer Fellowship in Creative Writing" (Press release). Retrieved 2019-04-07. "Norris Mailer, 6th wife of Norman Mailer, dies". Tulsa World. 2010-11-26. This page was last edited on 8 April 2019, at 11:21.